Think about all the different types of cleaners you currently have in your cleaning storeroom or cupboard. It is often like a toxic graveyard in there. Do you or your staff get confused with what product to use for which application? How often do you buy a new product without finishing the last one? Now add up the total cost of all these cleaning products and compare it to the cost of 1 litre of Natra-Kleen Concentrate. Remember – 1 litre will give you 66 x 500ml general purpose sprays, 250 x 500ml window sprays or 333 litres of floor cleaner. 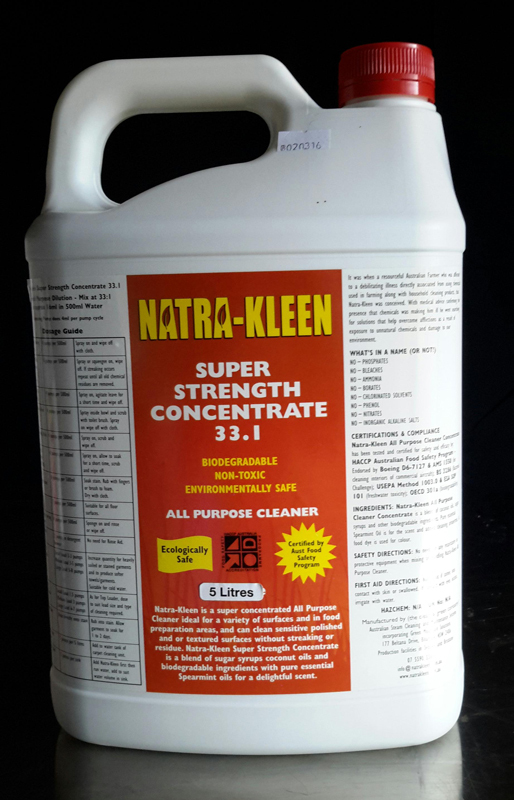 Natra-Kleen Concentrate’s unique formulation means that it is designed to replace most other cleaners with a single product. ALL of this can be achieved with 3 simple dilutions rates. In addition, all our clients report a significant reduction in their cleaning costs.